Since early March, several cities in Peru have struggled with a seemingly endless wave of heavy rains, floods, landslides, road closures, and lately school closures, just days after the opening of the 2017 school year. 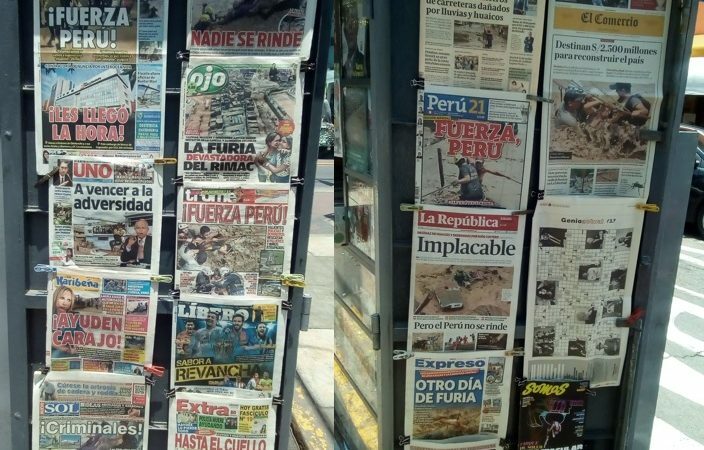 As the damage continues to spread, more and more ordinary people — in Peru and abroad — are joining efforts online to share the victims’ stories and convey safe wishes, using the social media hashtags #FuerzaPerú (Strength to Peru) and #UnaSolaFuerza (One Single Force). Peru owes its treacherous weather to what's known as Niño costero (Coastal Child). As of March 16, disasters this season have claimed 62 lives and affected 62,000 people. Ecuador is reportedly suffering, as well. A news stand on Saturday, March 18. Almost every headline is about the rains. Photo by the author, published with permission. I've arranged to deliver S/ 4,400 millones [about USD 1.3 billion] to the local, regional, and national government to start the reconstruction of affected areas. We are organized and prepared to face the emergency. Let's keep calm and do as authorities tell us. Esta emergencia pasará, pero tenemos que ser prudentes. No tomemos riesgos innecesarios como cruzar vías inundadas o puentes debilitados. This emergency will end, but we have to be cautious. Don't take unnecessary risks, such as going through flooded roads or over damaged bridges. Several groups are collecting donations for the worst-hit areas, where locals have made runs on stores, amid rumors and worries about supplies running out. Last week, there were reports of long lines at supermarkets to buy water, following service interruptions. Limeans go the Megaplaza shopping center to hand out donations. Lines to fill up buckets with water. It's like this all along the city. Parinacochas Ave, La Victoria – Lima. Bottled water sold out, endless lines at supermarkets. Preventing YES – Let's not go into panic. Food supply is guaranteed. 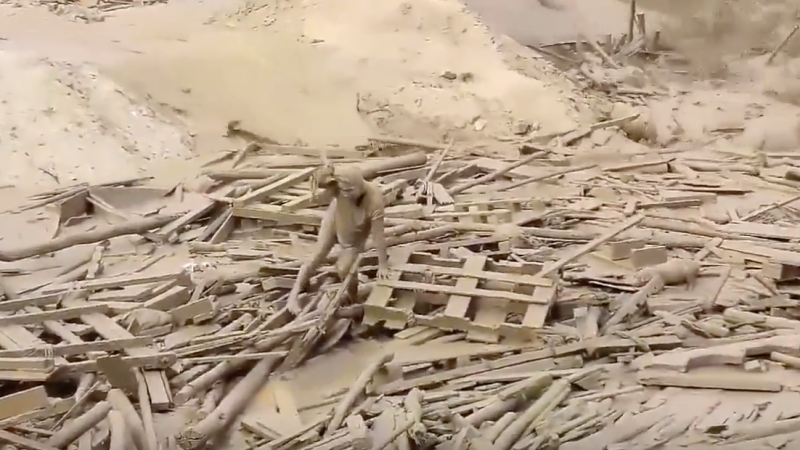 For the past week, a woman named Evangelina Chamorro has dominated the news, after literally emerging from the mud following a huayco (mudslide) in the Limean district of Punta Hermosa, where she lives with her family. 32-year-old Evangelina Chamorro escapes from death after a huayco hit Punta Hermosa and she becomes the symbol of the tragedy in Peru. Evangelina is currently recuperating in a hospital, amazingly having avoided any life-threatening injuries in the mudslide. This is the front page of today's edition, Thursday, March 16, 2017. The survival story also inspired a new image by Colombian artist Humberto Álvarez, better known as Alter Eddie, the author of website Se lo explico con plastilina (I'll Explain It With Clay Dough). Strength to Peru. Evangelina. Lima in emergency. Evangelina Chamorro, what an example of struggle and courage.